Everyone needs a few hundred rounds of ammunition stored up for a rainy day, so why not go ahead a buy a whole case? This ammunition is manufactured by Magtech, a Brazilian company, with ties to other manufactures around the world. Each round is loaded with a 115 grain FMJ bullet, using a Boxer primed brass casing, and is ideal for range training and pistol competitions. This ammo will produce mild recoil in full size 9mm pistols and moderate but manageable recoil in compact and sub-compact pistols. Self defense experts agree that if you carry a firearm for protection, then you should routinely practice with that firearm to maintain at least a base level of proficiency. Glock 19, 5000rd, ZERO FTF, ZERO FTE. Canik TP9SA, 5000rd, ZERO FTF, only 1 FTE. Taurus 709s, 2500rd, ZERO FTF, ZERO FTE. Hi-P 995TS, 3000rd, only 1 FTF, ZERO FTE. KelTec Sub2000 gen 2, 4500rd, ZERO FTF, ZERO FTE. We attempted to keep the choice of guns in the "$500 and under" range we'd expect most average people to be able to afford. I really like it and the price is pretty good too! Great processing speed and product. Speed of delivery was great. Everything was smooth in the order process. I have never had a problem with this ammo. I ended up saving $26 on my order as compared to the local shops. I wish it was more as this is only $0.026 per round, but after 10,000 rounds this savings will be $260. I shot the ammo at a range and my weapons worked great. Great shopping experience with Bulk Ammo as always. 200 rounds with out an issue. I have been shooting Magtech for quite a while and it is what they sell at the range where I shoot. In the past I was shooting 38 special, but recently got a Glock 26. 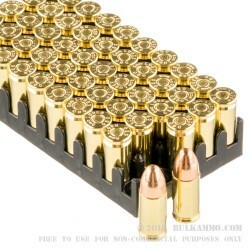 I ordered a case of this 9mm from BulkAmmo and it arrived promptly and in good condition so I immediately ordered another case. Good Quality, No Feed Issues. Great Fast Service! First and foremost, I couldn't have asked for faster shipping after an order process that was very much hassle free. I've been looking for a site to order ammo in bulk for some time now. 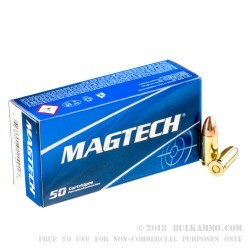 I finally settled on BulkAmmo.com, and ordered the Magtech in 9mm when it was on sale last week. It was a very good price for brass case ammo, and had by then close to 90 reviews, mostly positive, so I decided to pull the trigger (no pun intended, LOL!). Ordering from the website was a breeze, and my order arrived in just a few orders via regular ground shipping. This Magtech ammo has been outstanding in my Glock 19 (Gen 4). After about 300 rounds, no misfires, and accuracy is slightly better then other 9mm I've used in my gun. I will be using this ammo for my CHL test. but I have had good luck with Magtech ammo in the past. As for the service at BulkAmmo, it was great! Fast shipping, fair price, and a fair shipping cost. I will do business here again! 9mm Magtechs are the best 9mm out there! John based on your comments It worked in your Sig by not your Glock. Have shot over 3000 rounds of 9mm, not one issue ! I find the Magtech very clean to shoot compared to American Eagle and some other brands in that class. hmm....not bad! not great either but hey.... it goes bang! Have gone through about half of the 1000 rounds purchased and have had no hangs or mishaps. Accuracy is fine and I have found the Magtech 9mm Luger ammo to be reliable and pretty darn clean. Purchased 1k rounds and fired most of it in the last 2 weeks. Had zero misfires or problem of any kind. Have purchased from BulkAmmo several times. No issues whatsoever with service and delivery was fast. Several thousand problem-free rounds fired from S&W 9mm Pro Series, Glock 34 and CZ75B. Excessively Hard Primers - MANY FTF Issues!!! Great ammo will buy more when I need it. I would recommend. I ordered 1,000 of these 115 grain FMJ and have been very satisfied. The ammo is performing flawlessly in both my mod 92 Beretta and my Taurus as well, I will definitely order again. Excellent ammo for the price! Got the ammo super fast as usually with Bulk Ammo.com. I have shot 500 and no hiccups with my Glock 26. 1000 rounds in; 1000 rounds out. FLAWLESS! Magtech ammo is dependable & reliable. I've shot 1000's of rounds thru my XDsub-compact, not one problem ever!!!! BulkAmmo prices are VERY reasonable! The shipping is fast. This is not my first purchase from BulkAmmo and it won't be my last! Great price on good ammunition! Bought the 1000 round bulk and shot 200 rounds so far - zero issues. Seems to be cleaner than the Remington UMC and Winchester White Box ammunition. Q: Is this just for range ammo? A: Hello Timothy, This Magtech FMC ammunition is designed for target and range use. Q: First firearm. Will these fit my Ruger sr9c? Seems like this price is the best around! A: Hello Dave! You will have no issues at all with the standard 115 grain Magtech fitting in that Ruger SR9c. Q: I was just wondering if these are factory firsts or are reloaded rounds? Thanks! A: Hello Mitchell! Magtech ammunition is all factory new ammunition. Q: are your casings reloadable? A: Hello John! The Magtech ammunition is loaded into new, boxer primed brass that can be reloaded. Q: What are the ballistics on this ammo. A: Hello Ron! Magtech states the muzzle velocity of this ammunition is 1135 fps with a muzzle energy of 330 ft. lbs. A: Magtech is owned by the CBC group. They also manufacture ammunition under the popular name Sellier & Bellot. Two of their plants are located in Brazil, with additional offices in Europe and the United States. Magtech was once a part of Remington which changed to CBC in 1979. The Magtech brand of ammunition meets all SAAMI specifications. A: These bullets have a lead core that is covered by a copper casement. Neither the bullets nor the casings (or other components) will attract a magnet. You should have no issue using this round at indoor ranges. In fact, because the bullets are "cased" and not "jacketed" shooters will be exposed to less lead dust (these bullets have no exposed lead at the base of the bullet where jacketed bullets do). Q: Is this ammunition compatible with the S&W MP 9mm I just bought? Also, does it leave alot of powder residue or is it pretty clean. Thanks! A: Yes, this Magtech 9mm ammunition will be compatible with your S&W M&P9. It is fairly clean burning, but shooting 1000 rounds of it will leave a good amount of residue. Q: I have purchased thousands upon thousands of rounds of Magtech ammo in the past. To the best of my knowledge it has always been labeled as FMJ. but I see that the Magtech ammo you have listed is FMC. My question is two fold: 1. Have I been buying FMC all along and just didn't notice it? or is this actually different ammo? 2. What is the difference between FMJ and FMC? 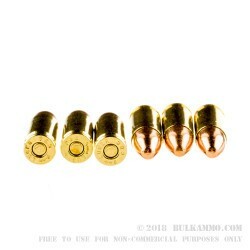 A: Full metal cased ammunition is functionally identical to full metal jacket ammo. While we can't be certain of what you bought in the past, we can say that if you were happy with the Magtech ammo you bought then, you will be happy with the ammo produced by Magtech now. Q: Hello. I bought this ammo recently from you: 9mm - 115 gr FMC - Magtech - 1000 Rounds. I have a Glock 17 (3rd Gen) & I want to do a trigger job on it. I need to know if the primer on the ammo I bought will "go bang" with the lighter striker spring of 4lbs (stock is 5lbs). A: The engineers at Magtech ammunition state that the lighter trigger that you propose will still work great with their 9mm 115 gr FMC Magtech ammo (9A) and is within the tolerances for this product.